Make your pasta recipes even better in the New Year by toasting it. Yes, indeed: Toasting dry, uncooked pasta in a dry pan over medium heat adds a nutty depth of flavor. You can toast any dry shape, from elbows to bow ties to orzo to wagon wheels. Place the pasta in a dry heated pan over medium heat and use a wooden spoon to move the pasta around for a few minutes. The pasta will turn a browner shade and will give off a toasty aroma. Then, simply cook the pasta as you normally would, in boiling salted water. When everyone asks what’s “different” about the pasta, clue them in to toasting. by Suzsanna Kilian | SXC. Find more tips and pasta recipes in our Gourmet Pasta Section. 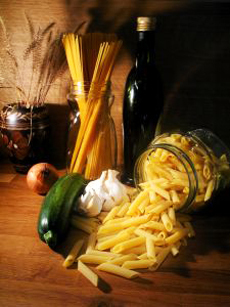 See all the types of pasta in our Pasta Glossary.